Kinunokai (絹の会) offers you the learning of making Tsurushi Kazari. Tsurushi Kazari is the festival for girls, held with its own unique tradition called Tsurushi Kazari that dates back to the Edo period. Mothers creat many dolls in prayer for the happiness of their children. We hope will come and see the home of this tradition of beauty and familial love that has been handed down over generations. The older people in Inatori tell about the origin of the tradition in the Edo period, when Hina doll display was something that only the well-to-do could afford. 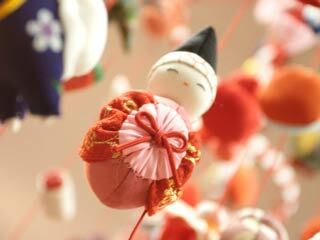 Instead, handmade doll were made to celebrate the health and growth of children and grandchildren. From parental love came the Inatori tradition of Tsurushi Kazari. The Tradition dates back to the latter part of the Edo period and is unique to the Inatori area. Older people born in Meiji period tell us that the practice existed in their childhood, making the tradition more than 100 years old, surviving the transition from Tokugawa government to Meiji Restoration. This distinctive tradition expresses affection and love for young children and wish for their health and happiness. Dolls are made by hand to pray for the sound and healthy growth of girls, preserving the significance and protocol of the tradition and carried on to this day as handcraft exclusive of Inatori town. Although the tradition thrived until the early 1950's when such dolls were seen in many homes, the dwindling number of people who were able to create the dolls made such dolls a rarity. Without a similar tradition in nearby towns and because of the beauty of these dolls, the local women's association organized a club in 1933 to bring back the sewing craft. Inatori Onsen Hotel Association asked the cooperation of the club in organizing the festival once again to restore this unique tradition for tourists. With the cooperation of older local citizens to provide old Tsurushi Bhina dolls and old design patterns, the festival won the Shizuoka Tourism Grand Prize in 2001, establishing itself for its popularity and drawing more than 200,000 visitors during the festival held each year from January 20 to March 31. Triangle : incense bag, when incense was very valuable. Because of its soothing scent, incense was regarded as having medical properties. Purple and white symbolize Mt. Fuji. Peach: symbol of protection from harm and illness and wish for long life. The peach is a feminine symbol and believed to protect girls from harm. Crane: a symbol of long life. Tortoise: a symbol of long life. Mouse with bags of rice: as the messenger of the god Daikoku, the mouse is regarded as the symbol of wealth, mystic power, fertility and diligence. The bag represents bounty. Crawling doll: this is an expression of the parental wish that a crawling baby soon stand, and once a baby stands, that the baby start walking. A symbol of parental wish for healthy growth of the child.